Below you will find a list of all the Real Deal Bet bonuses - offered to new players. The right side offers a casino overview (click to scroll through the images). Real Deal Bet is a relatively new sports book having launched in 2015. Don't let that fool you though as they are not rookies and once you visit their online gambling site that will soon become apparent. This bookmaker offers a massive range of sports betting options and many boxing puns thrown in too. The site is partnered with Evander Holyfield, the boxing champion, who moniker was "Real Deal". 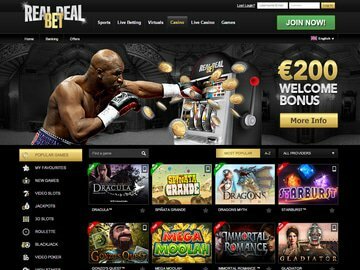 Real Deal Bet is licensed and regulated by the jurisdiction of Curacao and offers sports betting, virtual betting, an online casino, and a live dealer casino. In this review for Canadian bettors, we are focusing what this site has to offer when it comes to sports betting. The site offers wagers on more than 60,000 events each month and this covers more than 30 international sports, over 150 football leagues, and over 200 live bets on 18,000 events each month. New players from Canada can claim the Real Deal Bet Bonus which is 100% up to $100 using bonus code RDB100. This can be used to place bets on all your favorite sporting events. Players can also claim a monthly bonus of 20% up to $20 on further deposits into their account. This bookmaker also offers consistent small bonuses and promotions so be sure to check out their offers page to see what you can claim. There are monthly bonuses available too. 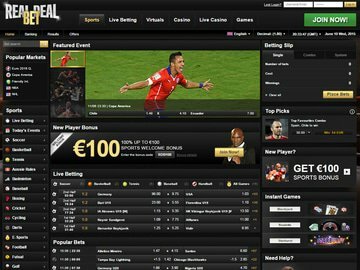 RealDealBet includes a mobile version of their website where customers can make bets before and during different sporting events. The mobile sports betting site is fully optimized and everything you need is available including the ability to deposit and withdraw funds. The Real Deal Bet mobile app is very easy to use and during our test we were surprised at how easy it was to use. The design of the mobile app is based on the desktop version of the site. It is fast, reliable and includes everything the desktop version has. If you enjoy betting on the go you won't be disappointed. This bookmaker offers a live betting section where you can place instant bets on current sporting events. It is really easy to find and all you have to do is click on the "live betting" button at the top of the website. The layout is very easy to read and follow and there are plenty of options available covering many leagues and events. Popular markets include The Premier League, Serie A, The Bundesliga, and La Liga. Real Deal Bet also offers live updates on scores so you can follow the game right on the website. Alerts for bets that are closing soon are also provided so you never have to miss out on that all-important wager again. When it comes to odds, this sports betting site displays their odds in UK odds, decimal odds, and American odds, making it perfect for all bettors. The minimum wager that can be placed is $0.10. The maximum bet varies depending on the sport and type of wager you are placing so be sure to check the website for further details. The maximum win that a bet can produce is $50,000 but again this depends on the event, so be sure to check the website. There are special bets available for eSports too. The Real Deal Bet website has a simple black design and the betting menu is very easy to understand. The site has a similar layout to other sports betting providers. The site has been created for professional and hobby bettor and even though boxing is not the number one sports, the site still invites players to wager with Holyfield as their figurehead. The functionality of the website is excellent. The detailed bets in the side menu can look a little clutter but the website still looks amazing and works really well on all devices. There is a separate results page too. To the left of the homepage, you will find all the quick links to take you exactly where you want to go. These quick links feature the most popular games at the moment. Further down the menu, you can choose from a huge selection of sports from football to darts and virtual games. When it comes to managing your account, you can make deposits using Skrill, EcoPay, Neteller, bank transfer, Paysafecard, credit and debit card. The site is secured using 128-bit SSL encryption ensuring that all your player data is kept safe and secure. There are only a number of supported currencies and these are Euro, US dollars, and Swedish Krona. It is a pity that Canadian dollars aren't included. The minimum withdrawal amount is $5 using Skrill. The minimum withdrawal differs depending on the method you choose. Withdrawals are free and they take between 1 and 7 days. E-wallets have faster withdrawal times compared with bank transfers. Customer support is excellent and is available via live chat and email. The response time for emails is very low and there is plenty of information available on the website too. Support is available in a number of languages too as is the Real Deal Bet sportsbook. As a new bookmaker, Real Deal Bet has made a great impression on the sports betting market. They have excellent odds and a massive range of sports including the increasingly popular eSports. The Real Deal Bet bonus for new players is excellent and will give you up to $100 to spend on wagers. They also have live betting, specials, great odds, and a whole lot more. For those who enjoy mobile betting the Real Deal Bet mobile app is perfect. All in all, this is a great choice for Canadians looking for an expert sports betting site.